Wednesday evenings are grocery shopping nights. 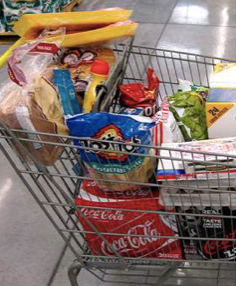 As I was filling up my shopping cart, trying to get enough food for at least 7 days, which is difficult to do when you avoid processed food, I felt like someone was following me. I saw a woman, mid 60s, about 50lbs overweight with turned out feet leaning on her shopping cart for support. She avoiding my gaze as I looked at her. I smile, I guess I was just jumpy. She kept following me in the produce department but didn’t put anything in her cart. As I got to the fish department, the nice guy who works there laughed, “oh Vanessa you must be getting your every 2 week piece of Salmon.” I commented on my exciting life. I eat very little meat, make myself eat some fish though. And still this woman seemed to be behind me even in the coffee isle. I saw a friend, he asked me how my marathon season was going and we laughed at the fact was only March and I had run 2 marathons, had one this coming weekend and my first 50 miler scheduled for next month. He asked how my personal training business was going, and I said great, and we said goodbye. “No,” she said, “you really have pretty legs and look so happy and healthy and yes I was eavesdropped and heard you are a runner and personal trainer, I really should exercise more, at least walk I guess, you look very motivational.” I smiled again and started to walk away. I avoid giving out free advice, something you learn after a few years in business. “Oh, of course, you only work out with rich clients, rich people are always healthier and buy better food.” She stared in my cart of fresh vegetables, “I wouldn’t even know what to do with ½ of that stuff in your cart.” Hers was full of processed food, frozen and boxed. I didn’t know what to say, I mean she is correct, you have a pretty substantial amount of disposable income to be able to afford a personal trainer 2-3 times a week that works with you privately. I felt guilty walking to my new truck outside. Because she was correct. My business had become more successful and I was making great money, but why wasn’t I able to help anyone that was like me? Like the 200lb. picked on 13 year old girl I had been? Like my parents who ate processed food, drank too much alcohol and smoked Lark Longs and both died in their 60s? How do I help the average person who can’t afford me personally one-on-one? My fitness studio has not gotten completely set up, it took us me 4 months to get my ADA permits and the bathroom is only 1/2 way done but hopefully will be done by the end of May. Then I can finish my video set up where I am not just doing videos but live streaming to my clients who can text me questions during the work out sessions. I will also be making videos for regular people, people with hurt backs, and painful knees, and people that need to lose large amounts of weight. These won’t be videos of a pretty person jumping around perfectly, these will be actual workout videos to help improve the life or average people. And even though the Fitness Book, It’s your Body, Move it, Love it, Live got slightly derailed as I opened up my fitness studio, I hope to have it out mid-summer. So stay tuned, even though my fitness business will mostly be my one-on one with clients, it will also include the book, speaking engagements, and videos so I can hopefully be able to help more people get healthy at a lower cost. Thanks to all of you for the support and here is to a healthier happier all of us!